Here at GeekTech, we've seen lots of contraptions to help the disabled regain some of their mobility. Now, a group of Swiss scientists from the École Polytechnique Fédérale de Lausanne (EPFL) have found a way to rewire the spinal cord of rats after a paralyzing injury. This rat (pictured above) was just paralyzed a few weeks prior and is now running on a treadmill. The team accomplished this impressive medical feat with an extensive treatment of electro-chemical therapy and training with the help of a robotic harness. The treatment starts with a round of injections that contain a chemical solution of monoamine agonists to rouse the dormant spinal cord nerves. These chemicals are used to replace the neurotransmitters (dopamine, adrenaline, and serotonin receptors) that normally triggered the brainstem. Once the chemicals have excited the spinal cord neurons, the scientists start electrically stimulating the spinal cord with implanted electrodes. This is done to retrain the rat’s nervous system to use it lower limbs again--it's much like training “brain control,” but with a physiological component. 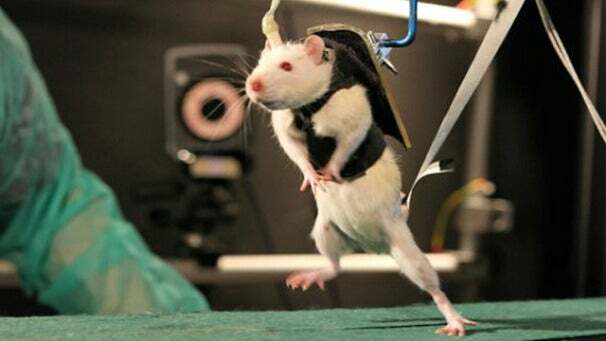 The rats were first tested on a moving treadmill where they instinctively walked forward with their front legs and previously paralyzed hind limbs. The scientist eventually moved onto “willpower-based training” involving a non-moving treadmill, a vest harness to force the rats to use only their hind limbs, and a piece of chocolate placed on the other end of the track. After two weeks, the rats began taking their first voluntary steps on their paralyzed legs. Soon after, the rats were able to walk for extended periods of time, sprint, avoid obstacles, and even climb stairs. These first successful trials with rats look very promising and human trails are in the foreseeable horizon, according to the EPFL. Courtine says that human phase-two trials will begin in a year or two at Balgrist University Hospital Spinal Cord Injury Centre in Zurich, Switzerland. The EPFL researchers are also currently working on a nine-million Euro project with NeuWalk to adapt the spinal neuroprosthetic system they used to treat the rats for human implementation.